Have you ever wondered why pigeons in particular seem to have a taste for urban living? They get chased by young children, run the gamut of bird deterrents and are flapped away by pigeon-phobics, yet still these birds choose concrete buildings, tarmac pavements and steel installations to make their home amid the hubbub of the city. On the other hand food is plentiful. For every child chasing them away there is a shopper happy to share their crumbs – and herein is one of the main attractions. A study did once suggest that smarter birds adjust to life in towns and cities as their bigger brains help them to navigate the varied layout and challenges of urban living. 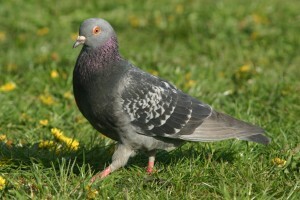 However, it could have more to do with the humble pigeon’s heritage than its brain size or penchant for bakery crumbs. Descended from wild rock doves, which roost on cliffs and ledges, it is understandable that their feral pigeon relatives enjoy the cold comfort of city high-rise buildings and ledges, which mimic the cliff-side home, but away from the perils of some of nature’s predators. And it is also no wonder these birds seem to be everywhere – there are as many as 28 million in Europe alone. However, city pigeons do face some of the threats they would out in the wilds being the food of choice for the re-emerging Peregrine falcon population, which also has a tendency to make its home in cities – and of course there are always cats to be considered. Despite this the much smaller chance of encountering predators in the city is a reason why pigeons thrive in urban areas. Not having to work too hard to find food is another reason city living suits pigeons. As well as the food left behind by shoppers there are also plenty of people willing to feed pigeons, despite this thwarting councils’ efforts to reduce the population. With high rise ledges to perch on, a ready food supply and a lack of natural predators it is no surprise that city dwelling suits pigeons down to the ground. The lesson to take away would be if you want to keep pigeons off your property, put deterrents in place to make any ledges inhospitable, and make sure all food is cleared away thoroughly. Contact Total Bird Control today to discuss ways to protect your property from pigeons.